KC Properties is pleased to offer you this lovely apartment finished to a very high standard and boasting splendid views to Pirin National Park. 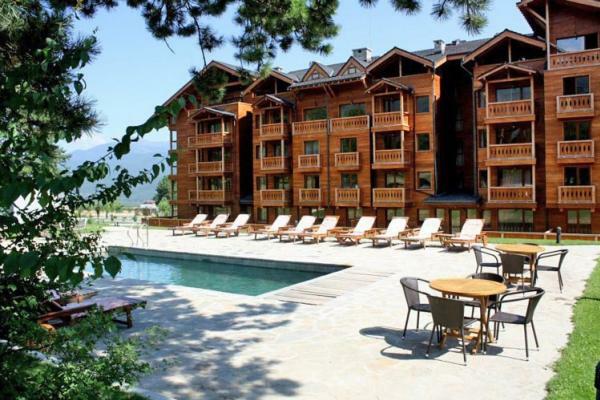 The studio is part of the pearl of Razlog valley – 5***** Pirin Golf and Country Club which offers to its guests luxurious ski, spa and golf properties. The place is preferred destination by tourists from all over the world, attracted by the beautiful nature and top quality services. - Balcony with fantastic views to the mountains. The studio is finished to a high standard and is fully equipped with everything necessary that you will need for a pleasant stay. There is equipped kitchen with modern appliances, double bed, breakfast bar, TV, fully finished bathroom. *The price of the studio can be paid for a period of 1 year! Pirin Golf & Country Club is an international 5-star complex, which offers vacation properties and luxury trade areas for sale and rent and manages a top-level golf club. Situated on an area of 150 hectare, in close proximity to the world famous ski resort Bansko, the complex provides the unique opportunity for a golf & ski vacation, thus ensuring high investment returns and benefits for investors, holidaymakers, golf lovers throughout the year. The vacation properties are ideally situated amidst lofty pines and lush meadows, making up 5% of built-up area. They are arranged into three separate districts (Downtown, Lake, Pirin) and each offers a different experience and added value to the owners – whether as an investment or lifestyle. The master plan represents a self-sustained town including a commercial downtown area and different residential districts. Besides a special place for spending your holiday, Pirin Golf & Country Club provides a wide range of investment opportunities. You have the possibility to buy a property for future rental or rent trade areas for the development of your business. The properties within the resort benefit from the beautiful mountain location, gated community and top class facilities, ensuring that rental capacity will be maximized throughout the year. This unique opportunity of private Residents Only Golf courses and the accessibility to the ski slopes of Bansko makes this development an investment that really works. • Variety of baths, massages and spa treatments in the Spa & Wellness Center of the hotel with a total area 4500 sq.m.